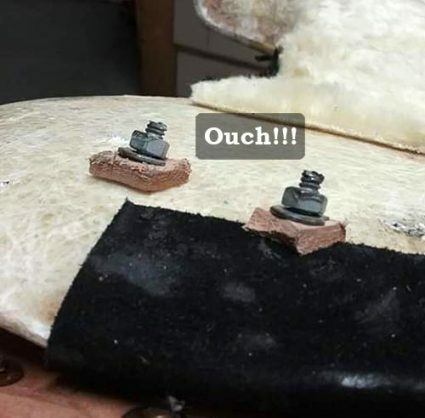 Articles First Time Saddle Buyer Beware! First Time Saddle Buyer Beware! A few years ago at a horse expo in California I overheard a man talking to his friend after he had left our booth. He told his friend that our saddles were overpriced and how he had found a brand new saddle for under $500. He then went on to brag about his new $70,000 horse trailer and his new $50,000 truck to pull it. Guess what? Your horse doesn’t care about your new $70,000 horse trailer and your new $50,000 truck to pull it. But I guarantee your horse cares about the saddle you put on his back. CJ showed me a post on Facebook the other day of a sub $500 saddle that was built overseas. No makers stamp, no serial number, no identifying mark of any kind. Although this saddle is advertised as ‘lightweight’ and ‘affordable’ let’s talk about what it really is. For starters the tree is made out of fiberglass which in itself is not necessarily a bad thing. I have seen plenty of trees made of wood and covered with fiberglass instead of rawhide. The problem here is that this tree is made out of Styrofoam and covered in fiberglass. It’s basically hollow! While this will keep the finished weight of the saddle down, it doesn’t offer much structural integrity. 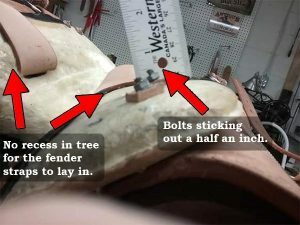 This explains why they had to use bolts that went all the way through the tree to attach the rigging instead of screws. Screws would have pulled right out. Just imagine your horse, who is so sensitive to touch that he can feel a fly land on his back, being ridden with bolts sticking out a half an inch down into his back. Lightweight is not always better. As if the bolts sticking out the bottom weren’t bad enough for the horse the bars of the tree are asymmetrical with the rock and twist not even coming close to something that would work on a horse’s back. A horse’s back is narrower right behind the shoulder and flattens out wider as his back progresses to the rear. This tree is wider at the front becoming narrower towards the back which is opposite of any horse I have ever seen. Another thing to notice is that there is no recess in the tree for the fender straps to lay. 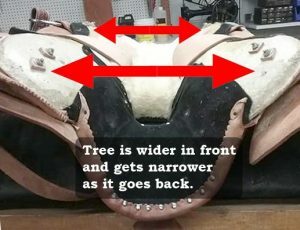 A good tree always has this recessed area so the straps don’t cause pressure points on the horse’s back. Affordable? Is it really? What does it cost to have the vet out these days because you injured your horse’s back after just one ride? And consider the materials in a $500 saddle. A tree made of fiberglass covered Styrofoam cost less than $10. The leather used (if it actually is leather) is usually ‘urine tanned’. Yep, that’s a real thing. Go ahead and Google it. I’ll wait…. Disgusting right? Get a little rain on that new saddle and the smell comes back in full bloom. Yuck! The skirting on a good quality saddle is made of 2 pieces of leather stitched together along with sheepskin. On some of these saddles they are using thick paper laminates instead of a second piece of leather. The paper is sandwiched in between the top piece of leather and the sheepskin on the bottom so you can’t even tell its paper. Oh and did I say sheepskin? Not on a sub $500 saddle. You are going to get some kind of cheap thin synthetic fleece. Companies that are making these ‘affordable, lightweight’ saddles are preying on the first time saddle buyer. Unfortunately these companies can’t be held liable for these saddles even though they are putting the horse at risk, as well as the rider if he gets bucked off. When you think about all of the money involved in the owning and upkeep of your horse, not to mention what we ask of our horses as far as hauling us around in all kinds of terrain, buying a quality saddle should be priority one. This is an excellent article, but I would expect nothing else from the owners of Synergist. You know your business — making excellent saddles! I have been a Synergist owner (and rider) for many years and feel there is no better made saddle. Plus, I feel that I have you, as saddle makers, behind me at all times. If I ever have a problem I know you will be there to help. For a custom made saddle, your prices are well below the prices of other companies. Thank you for my totally custom saddle. I absolutely love it, as do my horses. Great article! We were just talking to our Farrier about this very thing. Money spent on trucks, trailers and fluff but then going cheap on tack and Farrier care. Badly fitted bits, saddles and pads, cheap feed and hay, etc. Its no wonder horses loose it after awhile. I’ll stick to my synergist saddle!